A nonprofit works thanklessly for a cause. A real cause they believe in and they work hard to get others to follow them. Typically, a nonprofit engages in activities like spreading awareness of the cause, sensitizing people about the issues, getting contributions from believers, and attracting volunteers who can help out. Nonprofits may not have CMOs or huge marketing budgets like for-profit corporations. But to make these activities successful, they must engage in marketing just like any other company. In fact, they must adopt ‘guerrilla marketing’. Guerrilla marketing is a strategy to promote products and services in unconventional ways using small budgets. The key aspect that differentiates guerrilla marketing is personalization. Personalization is the unfair advantage a nonprofit can have to ensure a higher conversion rate of their marketing activities. In this post, we will focus on nonprofits’ print marketing and how they can use technology to engage better with their audience. Nonprofits invest significant amount of their marketing budgets in outdoor and print media promotions such as brochures, flyers, newsletters, outdoor activities by volunteers, and signs. But unlike digital marketing, print promotions are neither actionable (in that moment) nor trackable. The good news is that QR Code technology can easily solve this challenge. A QR Code is an advanced form of barcode which can be scanned and read by using smartphones. QR Codes are now extensively used by marketers to connect consumers from offline media to dynamic online content. Compared to digital marketing, QR Codes are relatively inexpensive and easy to implement and manage. Your flyers and brochures have limited space but not you website. The real meat of your content lies on your website and I am guessing you want your audience to eventually go there. By adding a Website QR Code on flyers and other print media, you can allow people to quickly visit your website. When the QR Code is scanned using a smartphone device, the device will open your website on a mobile browser. Not just a website but you can lead potential followers to any webpage/URL that has relevant information about your cause, event, leaders, or campaign. 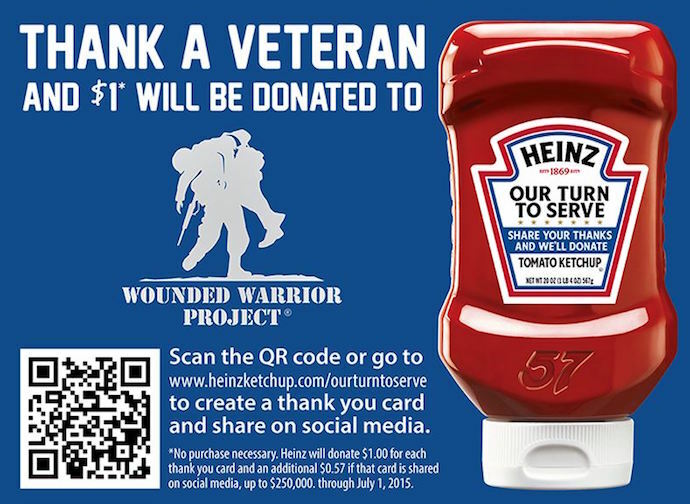 Heinz ran a corporate social responsibility campaign where it asked consumers to scan the QR Code, thank a veteran, and spread the word on social media. For every thanks, the company donated $1 to the Wounded Warrior Project. If your nonprofit is looking for contributions, then you should add a QR Code that allows believers to instantly make a payment. People are busy and if you wait for them to go home, log on to their computers, and then make a donation, your conversion rate will significantly be lower. 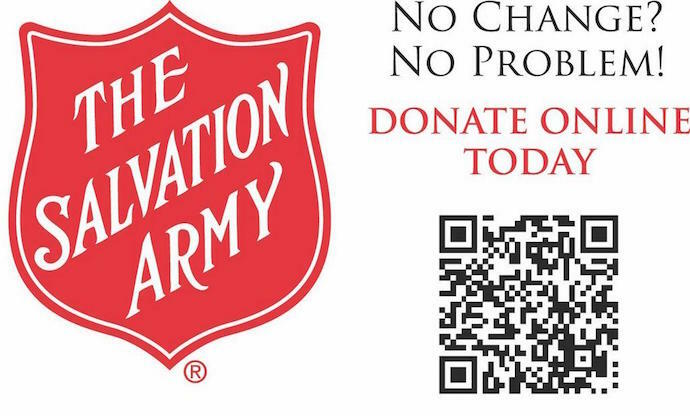 Salvation Army in the US invited their field units to add a QR Code on their Red Kettle, a donation kettle used to feed poor people during Christmas and Thanksgiving. People who wish to donate in the kettle can scan the QR Code and donate $10 using their smartphones. If your nonprofit has a Paypal account, then you can create a PayPal QR Code to accept donations. When scanned, your PayPal payment page will open in the mobile browser of the scanning device. Acquiring Facebook or Twitter followers via paid ads online can be very expensive. And sometimes followers attracted using paid ads are not relevant at all. Why not acquire real followers directly from your print media/outdoor promotions that you already do? 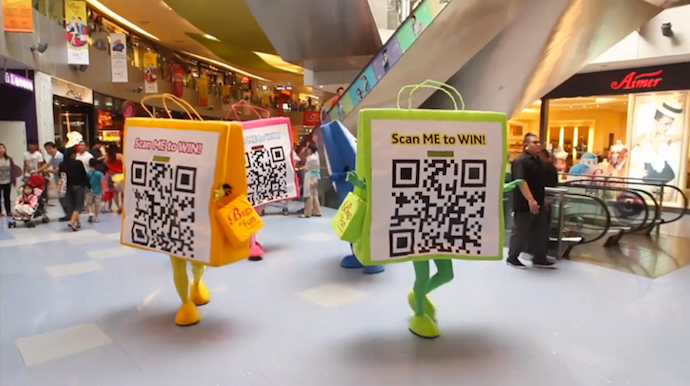 Vivocity, Singapore’s largest mall, created four QR Code ‘mascots’ dressed as shopping bags. On scanning the QR Codes on these mascots, people could win rewards and were asked to like Vivocity’s Facebook page. Liking their Facebook page and sharing it publicly doubled the chance of winning rewards for participants. By using QR Code in their outdoor promotions, Vivocity managed to increase their Facebook fan following by 33%. To run a similar campaign, all you need is a Facebook QR Code or Twitter QR Code. Or better yet, simply create a Social Media QR Code which leads to a page that has links to all your social media profiles. The potential follower has the option of choosing her favorite platform. Also see how a giant QR Code mangrove in Tuvalu was used to spread awareness about climate change. If you are a non-profit, you probably organize a number of events to promote your cause. 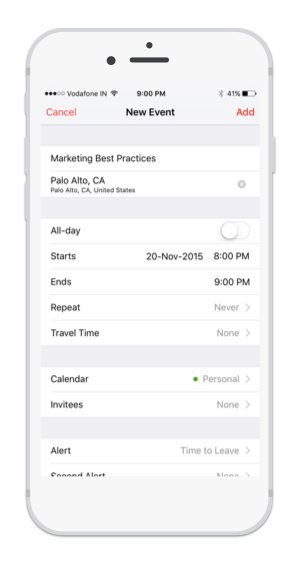 In the event promotional material, you can add a Calendar Event QR Code, which prompts the scanning device to save the event details (specified by you) in the default calendar application of the device. This will ensure that your supporters are reminded of the event and you get a higher turn-up. If not an event reminder, you also have the option of adding a Google Maps QR Code to your flyers or brochure. 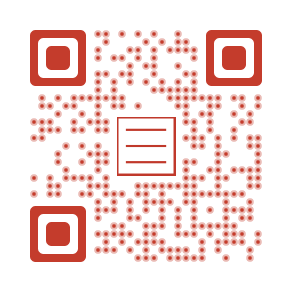 When this QR Code is scanned it will pin point a location on Google Maps (browser or app). This location can be your office, event or meeting venue. This will ensure that the attendees have the exact address and do not face any trouble in reaching the venue. As a nonprofit you probably sensitize your followers via rich and engaging content. This content could be a video, photo gallery, documents related to your cause, or audio clips. Instead of directing followers to your website and leaving it to them to find the right content, show the content directly. 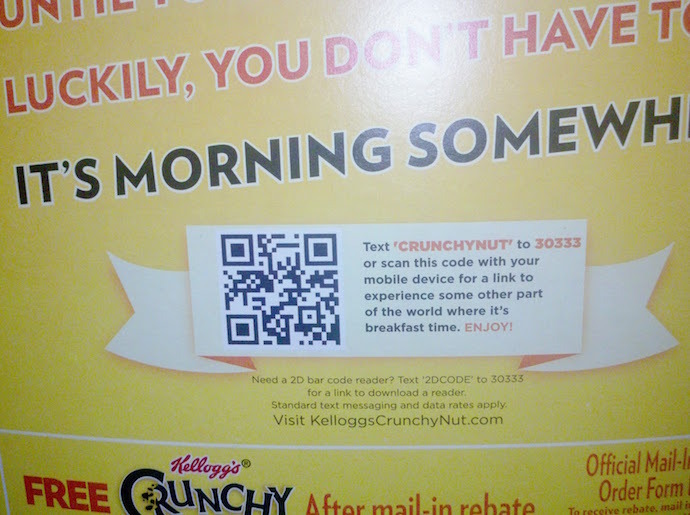 Just as Kellogg’s (though not a nonprofit) did by adding QR Code on the packaging of their Crunchy Nut product. When scanned, this QR Code allowed people to see a video. It showed ‘one can eat Kellogg’s anytime and do not have to wait for the next morning‘. Similarly, nonprofits too can create a QR Code for Youtube videos, PDF document, image, or audio to show relevant content of their cause. These are just 6 ways of getting more out of your print marketing. But if you are creative, you can come up with your own innovative way of using QR Codes to engage your followers or potential volunteers. Have an idea? Share in the comments below. Or if you are ready, get started by creating your first QR Code.